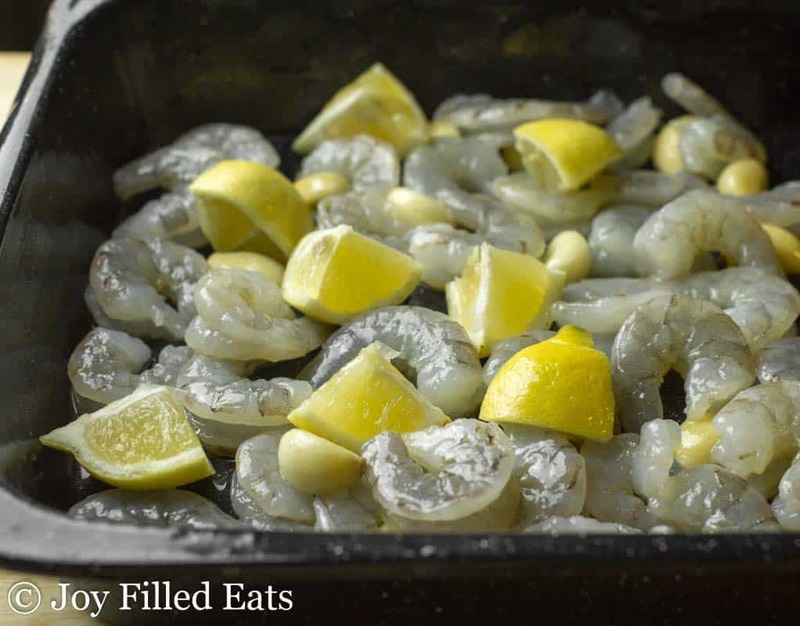 This Baked Shrimp Scampi is as easy as tossing a few ingredients on a sheet pan and popping it in the oven. With a little lemon, garlic, and parmesan cheese you have a fabulous dinner in no time. 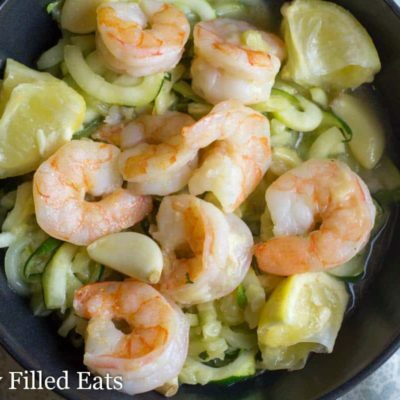 Ever since my sister-in-law Julie baked shrimp for dinner one night that has been my favorite way to prepare it. You just dump it on a cookie sheet with some herbs, veggies, and spices and pop it in the oven. It comes out perfect every time. A few weeks ago we had Julie and my brother-in-law Lee over for dinner. Since two of my kids were at grandma’s for the weekend we decided to splurge and have shrimp for dinner. Those two kids could each eat a pound of their own shrimp. That is why we eat poultry and pork for dinner most nights. It is much more economical when feeding a big family. 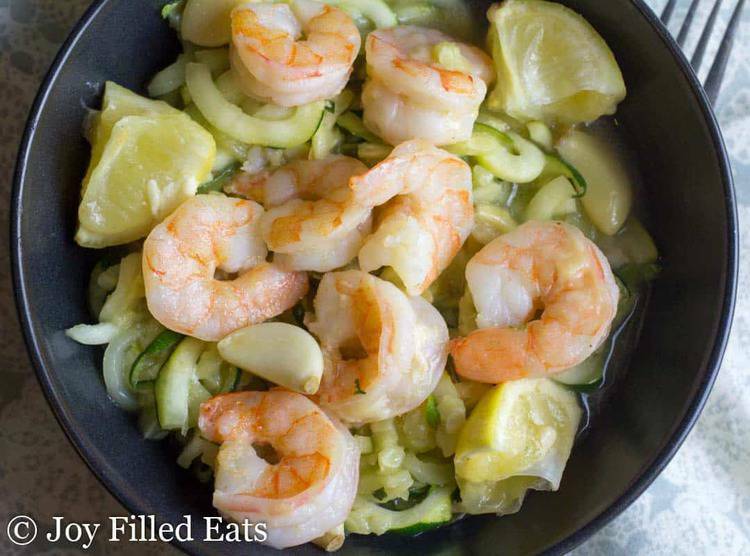 I lightly sauteed my zucchini noodles and then just dumped the shrimp scampi on top. I served right from the pan. My company did not complain. I love my spiralizer. I don’t use it as often as I like because with a small kitchen I have to put it away into the bottom of the closet but every time I pull it out I think how I need to use it more. Besides zucchini, I love using it for sweet potatoes. 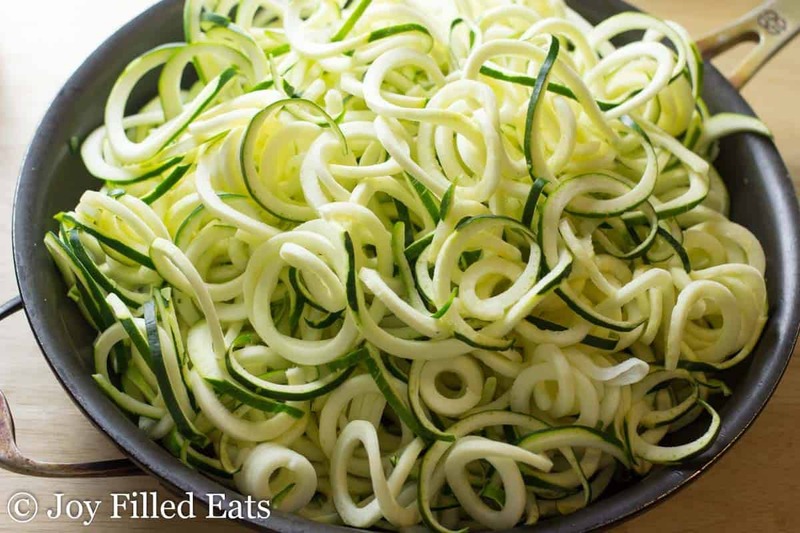 They are amazing spiralized and roasted. 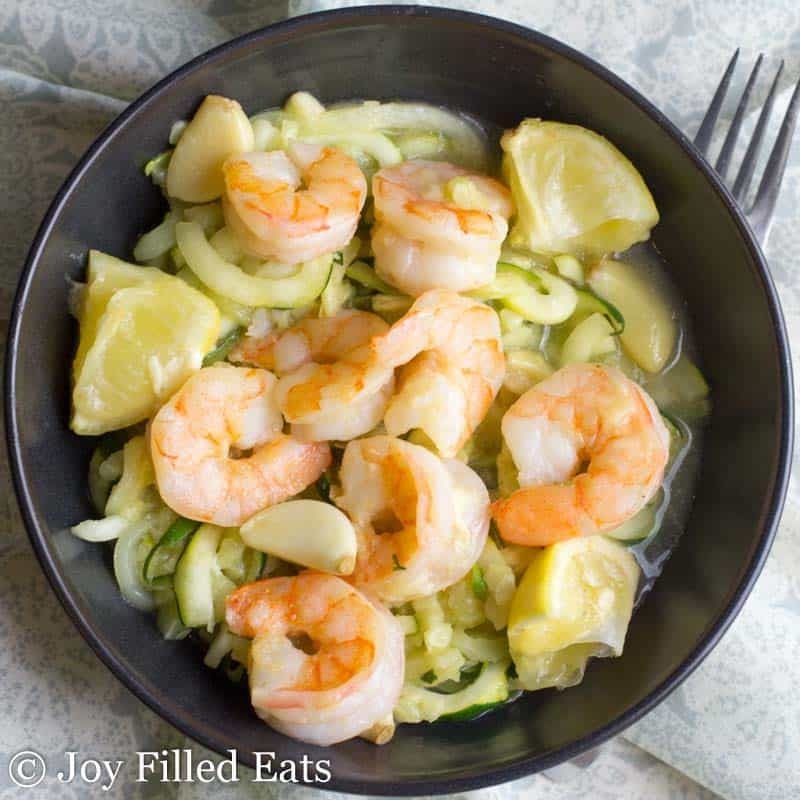 Cucumber noodles are fun too in the summer. This is the one I have. I got it 3 or 4 years ago when there weren’t so many brands on the market. I do highly recommend it if you don’t have one yet. I like the option of being able to make fat noodles or thin noodle. Thin noodles are great for cold salads. 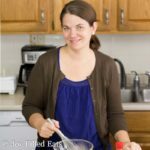 Combine the first 4 ingredients on a rimmed baking sheet. Toss gently. Bake for 13 minutes or until the shrimp are pink and opaque. Remove from the oven. Drizzle with the melted butter and parmesan cheese. 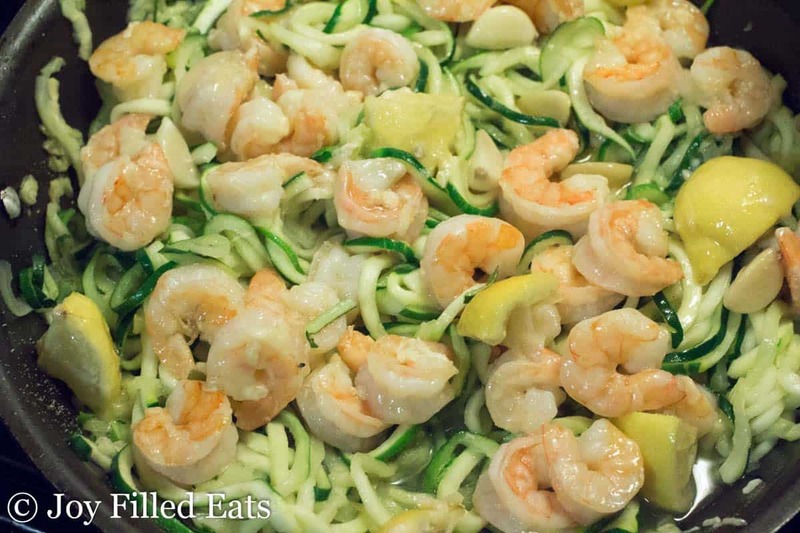 Serve over zucchini noodles, if desired.